I blame the Romney I bought at last Saturday’s spinning guild meeting. 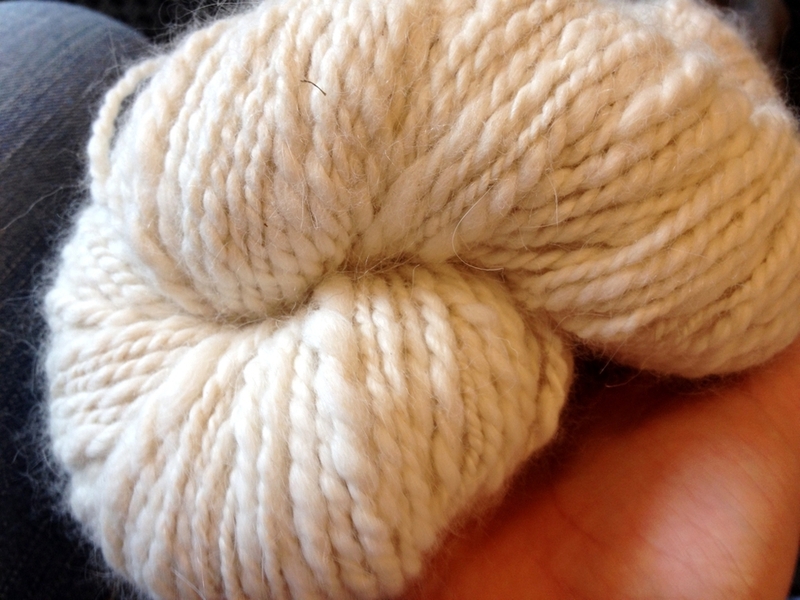 The fiber is lovely, soft, and clean but it still needs to be prepped for spinning. Unfortunately, I have no way to prep said fiber which prompted the last minute decision to rent the guild’s drum carder. It’s definitely large and in charge. So large, in fact, that I brought it home in a rolling duffle bag. Just what exactly I’d gotten myself into? Then guilt set in because there were only 2.5 ounces of Romney compared to the enormity of this hungry machine. The guilt didn’t last long because I started to remember all the alpaca, angora, and random bits of wool that have been sitting un-prepped and un-spun in my stash for years. And what about all that roving? Maybe I could experiment with that too. See ya later, Guilt. The first thing to hit the drum was some random bits of practice grab bag wool. Before feeding it through the drums, I pulled the chunks apart to thin them down a little. Didn’t worry about color or anything else. The wool went in until the drum was full and there still half a bag left to play with. 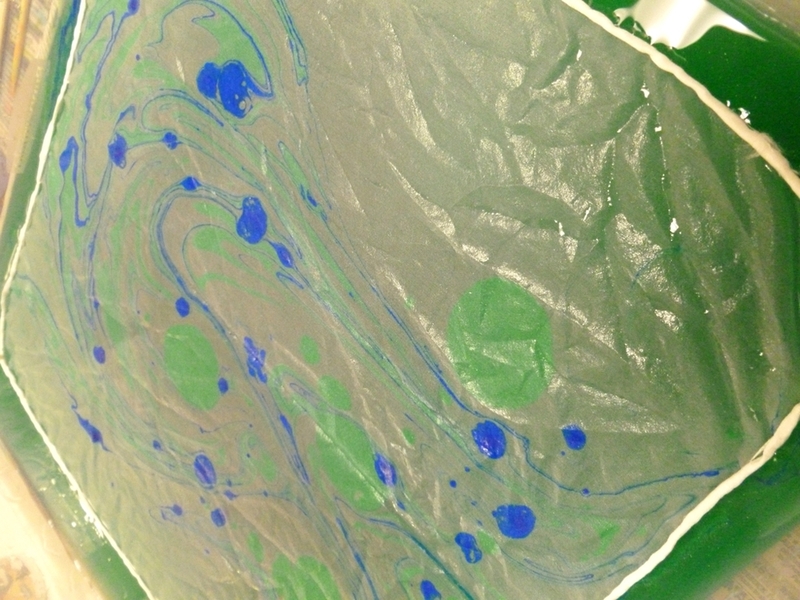 The colors blended beautifully though there are still random spots of solid blue after 3 passes through the carder. Looking forward to spinning it up and seeing the finished yarn. Since this was my first time using a drum carder, or a carder of any kind, I’m amazed at the transformation. Before, there were just squishy clumps of wool I didn’t know what to do with. Now, I’ve got something that I can’t wait to spin. Also, the process was a blast. Get to play with wool and fiber? Check. Get to play with color? Check. Get to make stuff? Double check. Me thinks that I’ve fallen down the rabbit hole and I have no idea how deep it goes. 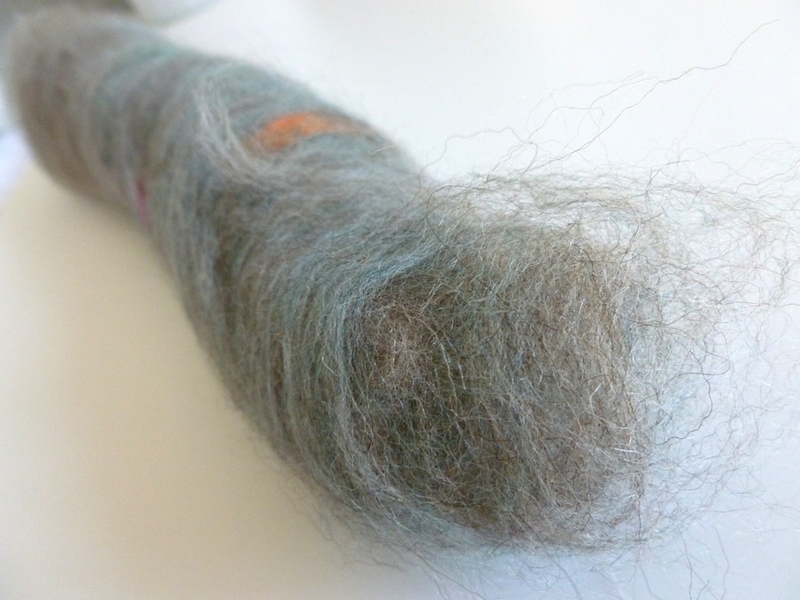 Since making those first 2 batts, I’ve done a little more research on how to properly use a drum carder. How to clean one too. The best info I’ve found is a 3-part series from vampy.co.uk. Part 1 is all about the basics of how a drum carder works and the necessary accoutrements. 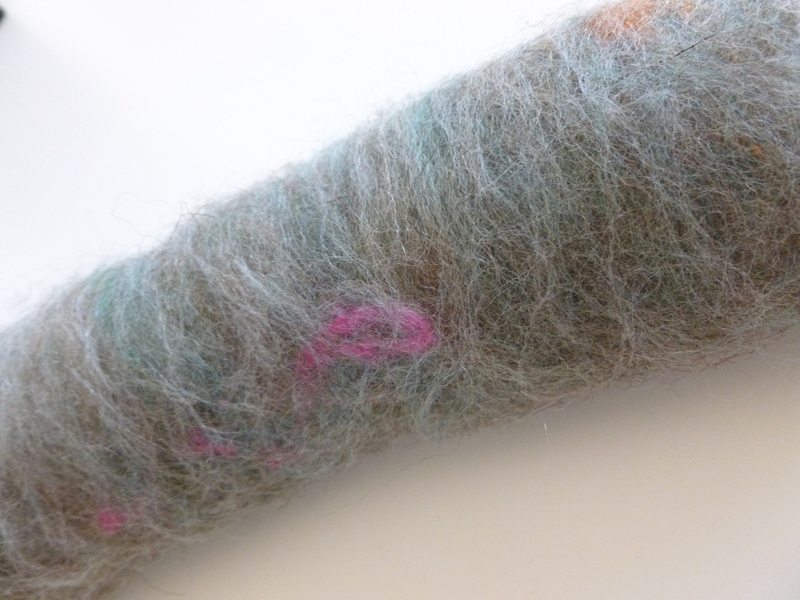 Part 2 is about carding raw fleece. 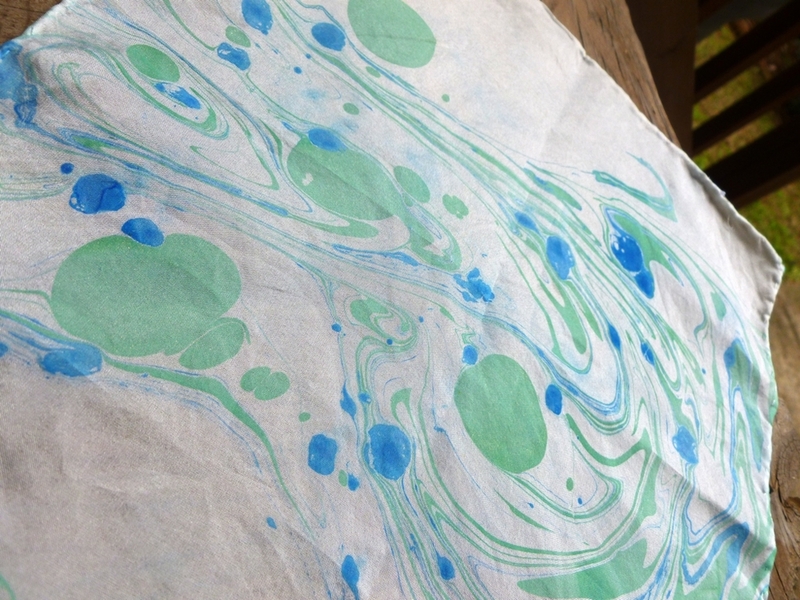 Part 3 is about how to blend fibers. Now that I’m armed with a little more knowledge, I’m ready to play around, experiment, and make more batts. Spinning Guild never ceases to be inspiring. There’s always something new to see, fiber to feel, and the simple contact high of being around other spinners. This month’s meeting on woolen spinning and prep was no exception. I picked up a few pointer about long draw and double drafting but was completely drawn into the process of making rolags on hand cards. I’d never seen anyone using hand cards in person before. 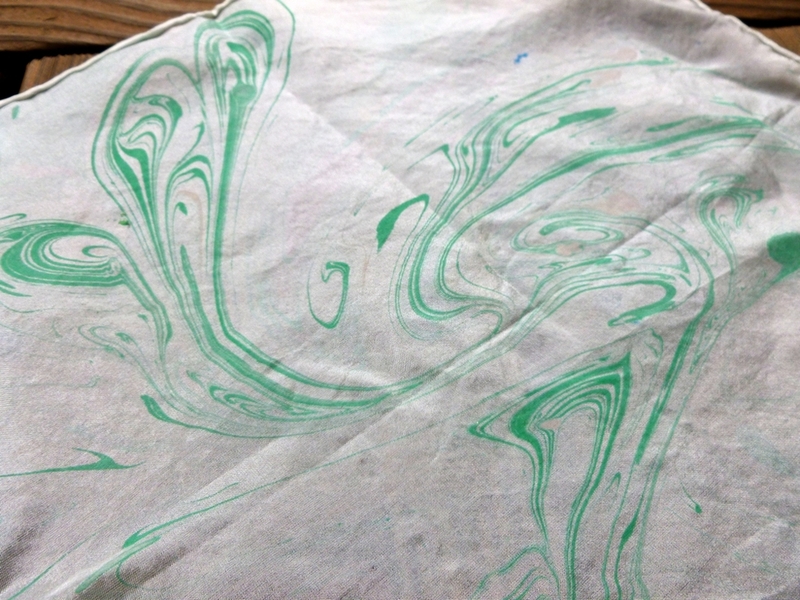 Our demonstrator used solid and dyed merino along with a little silk noil for interest. The finished rolags were thick and fluffy but also light and airy. The once distinct colors had blended and merged into lovely heather. The spinning taskmaster that lives in my head wanted to spin one. Thankfully, the teacher made extras for us to work with and I got to take one home. As soon as I free up a bobbins, I’m going to spin it up. The taskmaster will not be denied. If I like spinning from rolags and the yarn that it makes, which I probably will, I’m getting a pair of hand cards. In fact, I’ve already started researching them. Any suggestions for the perfect set? In the meantime, the teacher also showed us how to make fake rolags, faulags, with only a dowel and some combed top. Have a feeling that I’m gong to making a lot of those. 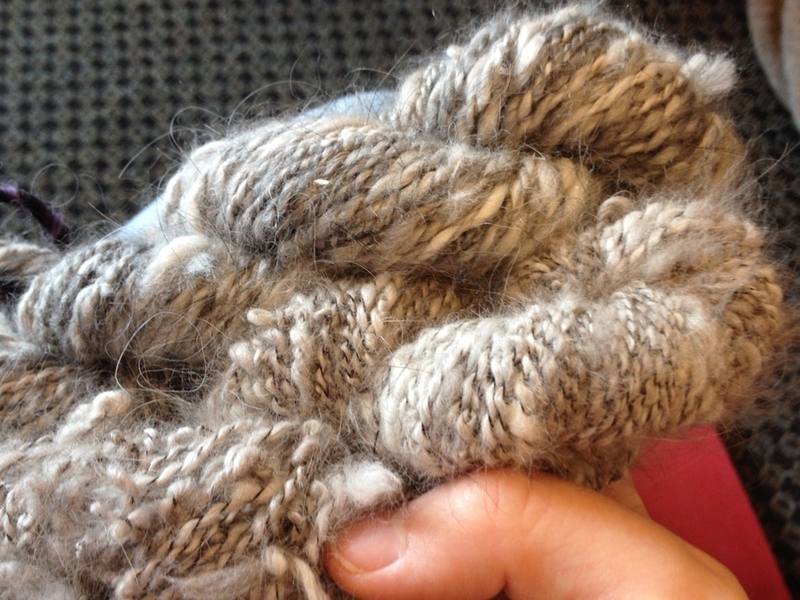 This month’s fiber guild meeting was a crash course in spinning angora. The Yarn Marm came by to demo and spread the love of Angora Rabbits. She also brought along a giant, fluffy ambassador named Albert. FYI, angora rabbits are larger than you think. 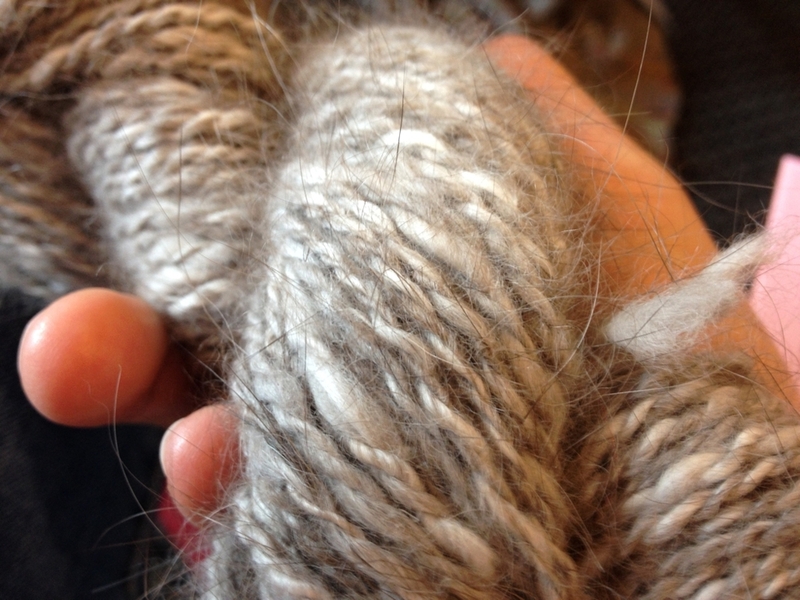 During the demo, several skeins of Yarn Marm’s handspun angora made the rounds around the meeting. Every single one of them was soft, fluffy, and absolutely luxurious. Most of the skeins were a simple 2-ply but a few were plied with thread. Of all the skeins I handled, the thread plied skeins were the most exciting and inspiring. 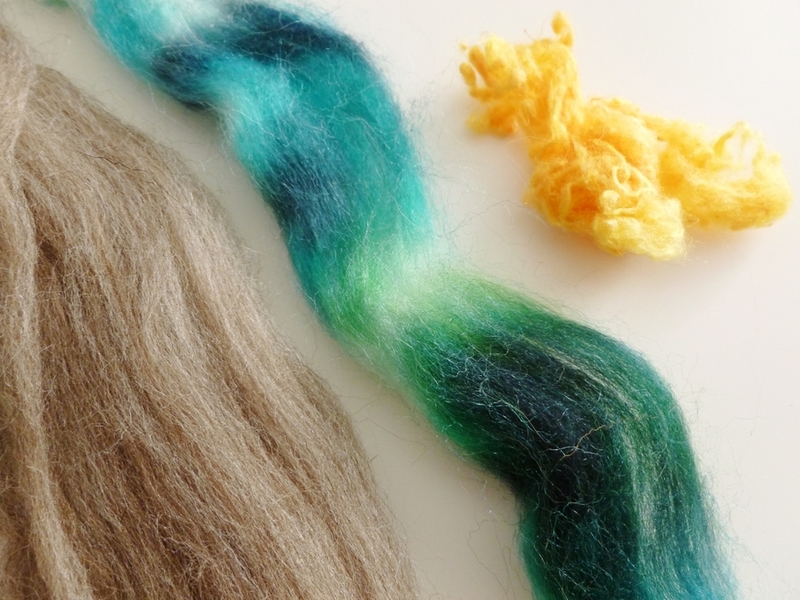 In the mid-levels of my fiber stash, there are several ounces of angora from two lovely rabbits named Harvey and Roger. It’s straight off the bunny with no further processing. Besides from lovingly petting it, I’ve had no idea what to do with it until last Saturday. Can I spin it as is without turning into roving? Yes. Is there a way to wash/full the yarn to prevent shedding? Yes. Now that I’m armed with a little bit of knowledge, I’m ready to dig the angora out and start spinning. So what that it’s probably harder to spin than superwash merino? I’ll cross that bridge when I come to it. 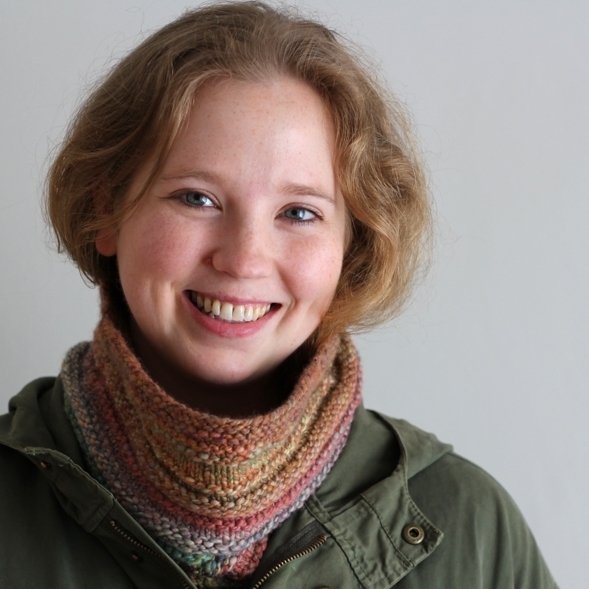 On the second Saturday of most every month, I head over to the Greater Birmingham Fiber Guild for our regular meetings. I know I’ve said it before and I probably will again but I love getting together with people who share this passion for fiber and art and knitting and making. It sets off this happy little creative spark in my brain. Plus, it’s just fun. At this month’s meeting, we had a visit from the lovely Gale Evans of Gale’s Art and her also lovely fiber. The topic was fiber and handspun yarn. What can you use it for? Anything. What’s the best fiber to learn to spin with? Blue Faced Leicester was a favorite. How many yards can you get from 4 oz. of fiber? It depends on the weight and the spinner. Along with the usual knitting in public component of the meetings, people also brought their wheels and were happily spinning along. There goes that creative spark. 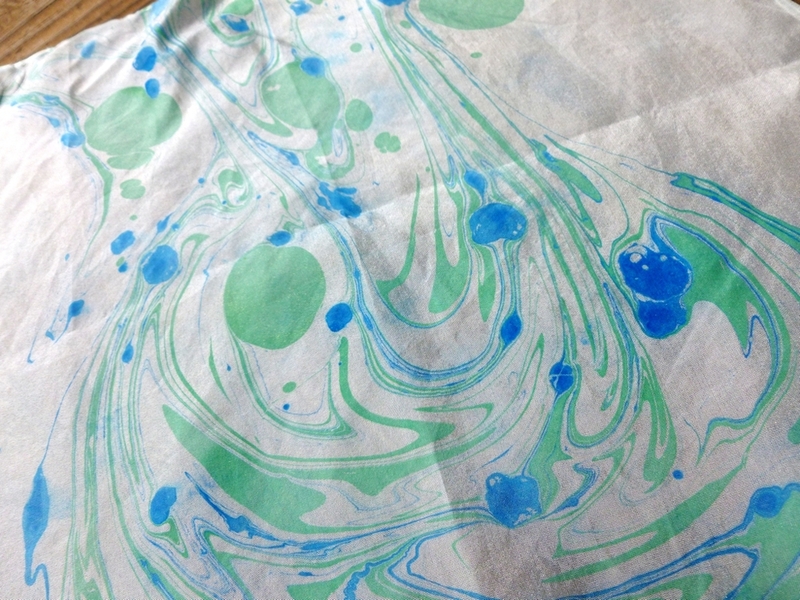 Besides from a variety of different wools, alpaca, and blends, Gale also brought a colorful bunch of silk hankies. I’d heard of silk hankies before and the fact that can actually knit straight from them but I didn’t give it much thought at the time. Just filed it away in my brain for later. It wasn’t until Gale demonstrated how to pull them apart, stretch them out, and cast on that my eyes got all big and round. Creative spark number two. Of course, I couldn’t leave without picking up a few supplies. How could I resist the silk, the colors, and a name like ‘Velvet Elvis’? Next month’s meeting is going to focus on spinning yarn with a spindle and I am so excited. I’ve been meaning to get back to my spinning for months and this is just the push I needed. I’ve already started practicing. Creative spark number three.